Dressy collar clip is chevron shape and studded with crystal rhinestones. 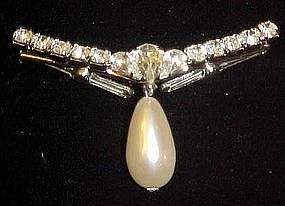 A single large pearl drop hangs from the center. Silvertone setting with 2 clips on the back. Measures 2 1/4" wide. Brand new condition! Shiny and bright.